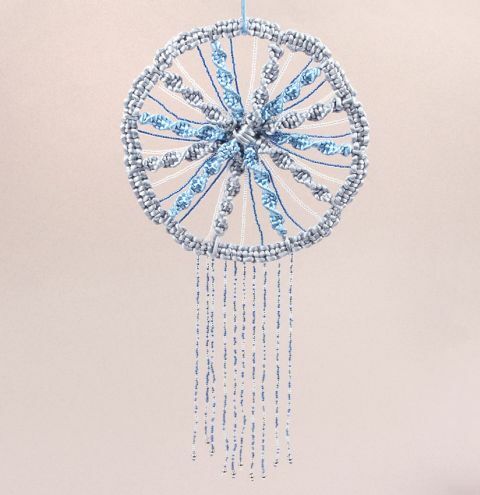 Learn how to make a knotted macramé dreamcatcher using seed beads and rattail satin cord. Follow the images and the instructions below to make yours! Cut a length of wire measuring approximately 25 inches long. If you want a larger or smaller dreamcatcher, don't cut the wire yet, simply unravel it slightly and manipulate it to make a loop. Cut it when you have made the loop as big as you want. Cut 2 metres of grey cord. Overlap your wire loop by an inch or so and start macrame knotting over this section. Follow this quick tutorial to learn how to macrame knot - CLICK HERE. Continue to make your knots all the way around your loop. If you run out of cord, follow the next step to weave your ends into your new knots made with the additional cord you'll have to cut. Once you have finished your knotting, fit the nose end of your chain nose pliers through your first knotted section on the ring. Grab one of the tails of cord and pull it through this gap. (See the image) Continue to pull your tail cords through the knots to hide them and secure them to your work. Once you have hidden the cords, you can knot them together on the back and add a drop of glue to secure it further. Take a new length of grey cord, measuring around 1.5 metres. Wrap this in and out of your hoop like shown in the image. Continue to wrap to make 6 strands on the front side. You can do more if you like. This will make 12 knotted sections. Take the end of the thread and wrap it around the centre of the cords, do the same with the other end of the thread. Secure the two ends of thread in place at the back of this wrapped section. Add a drop of glue and trim off the ends. Spread your threads out like in the image to make 12 strands. Starting at the top or base of one of your threads, make macrame twisted knots down the thread. Watch the beginning of this tutorial to learn how to make macrame twisted knots - CLICK HERE. Continue around your circle, knotting and alternating between grey and blue cords. Secure and knot the threads around the back of the dreamcatcher and fix in place with glue. Cut a length of thin beading thread and thread a needle. Secure this thread to the outer-underside of the dreamcatcher. Thread on a length of seed beads and sew this strand to the middle-underside of the dreamcatcher. Continue this process to fill the gaps between the knotted strands with strands of seed beads. Once you have filled all the gaps with seed beads and secured your threads on the underside, tie a small loop of thread to the top of your dreamcatcher. Manipulate your wire so that your dreamcatcher is as circular as possible. Take an armspan length of beading thread and thread on approximately 120 seed beads or make this however long you want the longest dangling strand to be below your dreamcatcher. After the seed beads, add a crimp bead, a silver round bead, a seed bead and pass back up through the silver bead. Continue to thread up through the crimp bead, all the seed beads and exit the top of the seed beads. Knot these two threads together at the top. Crush the crimp bead down at the bottom. Make as many of these strands of beads as you want. Finally secure them to the base of your dreamcatcher by threading on a needle and knotting the strands to the back of the dreamcatcher. Secure these with a drop of glue if you want.